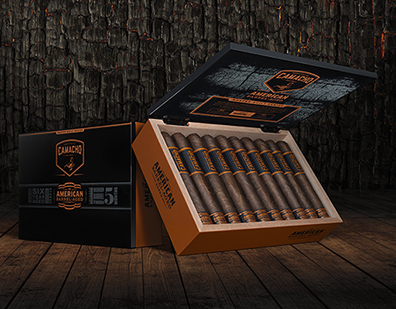 Camacho continues to blaze new frontiers with the introduction of its American Barrel-Aged cigars, the first in the company's Master Built Series of premium cigars. Camacho's master blenders/builders in the Dominican Republic aged Camacho's legendary Corojo leaves for six years and then sealed them in charred Kentucky bourbon oak barrels for five months. Just one of these very special leaves is added to each American Barrel-Aged cigar to amplify its complexity. Blended with American Broadleaf, Pennsylvania Maduro, and Barrel-Aged Corojo long fillers bound and wrapped in rugged and rare American Broadleaf, these medium to full intensity cigars offer a richness and complexity characterized by oaky flavors and sweet bourbon aromas. American Barrel-Aged is a powerful smoke that combines the essence of frontier mettle with Camacho's Cuban roots.